Beavers Bend Lodging information: privately owned beavers bend cabins and broken bow cabin rentals near the state park and lake. Privately owned and operated beavers bend cabins are hidden throughout the area, giving vacationers a home away from home. Renters can find just about any combination of amenities from the cabin selection offered. Fully furnished kitchens and linens for beds and baths are almost always included. Visitors will find cabins ranging from one room, no frills, to those hand-crafted made from solid log, accommodating over 15. When choosing a cabin for your visit, local area cabin management companies can fulfill your needs. The location of most rental properties are within a five minute drive to Beavers Bend State Park and Broken Bow Lake. If seclusion is a priority, look for cabins set on more acreage. This will give you and your family plenty of room to have privacy when sitting in the hot tub or gathering around a glowing fire pit. If you are pulling a trailer with a recreational vehicle, make sure the cabin parking can accommodate it. If you have any concerns about a cabin, ask the cabin manager. Groupon coupons are offered by Beavers Bend State Park only. Please contact 580-494-6300 for more information. Please do not call the private companies below about Groupon. Offers secluded beavers bend cabins minutes from Broken Bow Lake and Beavers Bend State Park. A private fishing pond and mountain top views are some of the great features of this rental company. Cabins located in the Kiamichi Mountains near Beavers Bend State Park and the lake. Hochatown Junction Resort is your source for cabin rentals near Beavers Bend and Broken Bow in southeast Oklahoma. Broken Bow Lake – Beavers Bend Resort Park, Oklahoma’s Premier Vacation Destination! If you’re looking for a clean and affordable Broken Bow Cabin without sacrificing luxury, you’ve come to the right place! Beavers Bend Getaways is a collection of privately owned cabins offering modern conveniences in comfortable settings and just minutes from outdoor fun! Beavers Bend cabins with mountain top views and free wifi located in Southern Hills area minutes from Beavers Bend State Park and Broken Bow Lake. 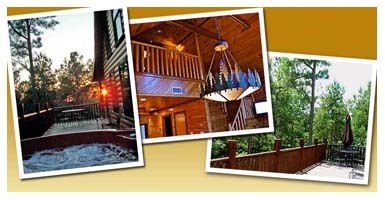 Beavers Bend Creative Escapes assists visitors with planning family vacations or romantic getaways. Secluded broken bow cabins located on 4 acres with a private stocked fishing pond, stocked with Catfish, Perch and Bluegill. Visit Hidden Hills Cabins in Broken Bow, Oklahoma. We have the perfect Oklahoma cabin rental for that Fisherman's Retreat, a Romantic Getaway for two or the Entire Family Reunion! Secluded Acres is located within minutes of Beavers Bend Resort Park, Cedar Creek Golf Course and Broken Bow Lake. Find the perfect cabin to get away from the everyday and create memories that last a lifetime. Copyright © 2015 Beavers-Bend.com. All rights reserved. No content to be used without written consent.